They are under direct supervision of a responsible adult (at least 18 years old) who is onboard. All boaters or passengers under the age of 12 must be wearing a Coast Guard approved Type I, II or III PFD while onboard a vessel is underway. Boating License or Boating Safety Education Certificate... is there a difference? The boating safety education certificate is proof that you have successfully completed a boating safety course. The certificate does not expire and does not need to be renewed. 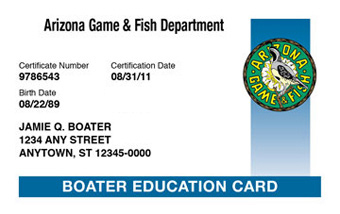 Therefore, it is NOT a Arizona Boating License!